Wilhelm Mohnke was born in Lübeck Germany on 15 March 1911. His father, whom shared his name with his son, was a cabinet maker. After his father's death he went to work for a glass and porcelain manufactuor, eventually reaching a managment position. Mohnke joined the NSDAP on 1 September 1931, and the SS two months later. He was assigned to the Lübeck Trupp, of the 4. SS-Standarte, where he was to stay until January 1932. Mohnke was then transfered to the 22. SS-Standarte in Schwerin, the same unit as Kurt Meyer. On 17 March, personally chosen by Sepp Dietrich, Mohnke became one of the 117 original members of SS-Stabswach Berlin. It was from this chancellry guard that the Leibstandarte was to grow. Eventually Mohnke took command of 5 Kompanie, in which capacity he served in the Polish campaign. On 21 September he was awarded the Iron Cross second class, the Iron Cross first class was to come just one month later on 8 November. Mohnke led 5.Kompanie at the outset of the Western campaign, taking over command of II.Bataillon on 28 March after the Bataillon commander was wounded. It was around this time that Mohnke was charged with murder of 80 Brittish prisoners of war of the 48th Division at Wormhoudt. Mohnke has never been brought to trail for these allegations, and when the case was reopened in 1988 a Germen prosecutor came to the conclusion that their is insufficient evidences to bring charges. Four years later, Mohnke's name was again mentioned with war crimes. This time as the commander of 1.SS-Panzerdivision Leibstandarte "Adolf Hiter", units under his command where charged with the "Malmedy Massacre". It is also alleged that Mohnke is responsible for the murder of 35 Canadian POW's while with the "Hitlerjugend" at Fountenay le Pesnel. He commanded the II.Bataillon during the Balkan campaign, where he lost his foot in a Yugoslavian air attack on 6 April 1941. It was the decision of the medics that his leg would need to be amputated, but Mohnke overode that decision. Still, his wound was so grievous that they were still forced to take his foot. While recuperating he was awarded the German Cross in Gold (26 December 1941. Author). Due to the severity of his injury, Mohnke did not return to active service until early 1942. It was Mohnke who planted the seed for the formation of the LSSAH Panzerabeitlung early that year. He charged Ralf Tiemann as his "Adjutant" and his first "official" task was finding "recruits". Tiemann than proceeded to compile a list, eventually with enough names to fill two Kompanies! While the newly wed Sepp Dietrich presented his new wife to his officers on 14 Janaury, Mohnke presented Dietrich with his personel list, wich had in the mean time turned into transfer orders. Dietrich, who was caught unaware, finally relented to Mohnke's pressure and signed the paper. So was born the Panzer waffe of the Leibstandarte "Adolf Hitler". It was not to be though, and Mohnke was relieved of his command and transfered to the the replacement battalion on 16 March 1942. 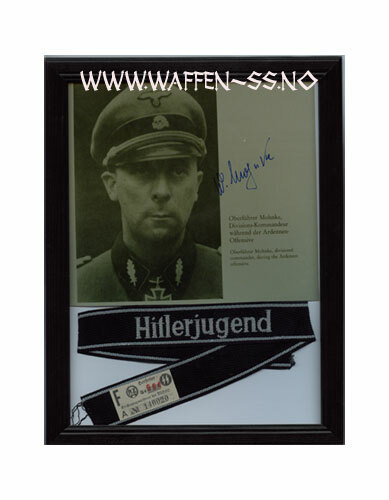 This is where he was to remain until the formation of 12.SS-Panzerdivision "Hitlerjugend". He was given command of SS-Pz.Gren.Rgt 2 (this was the original designation of SS-Pz.Gren.Rgt 26. It was renamed on 30 October when the entire Division was reorganized into a Panzerdivision). Leading the young grenadiers in Normandy, SS-Pz.Gren.Rgt 26 was responible for holding the brunt of the allied offensives from 10-20 June, wich resulted in Mohnke being awarded the Knight's cross on 11 July 1944. Mohnke led the LSSAH throughout Wacht am Rhine, and was promoted to SS-Brigadeführer on 30 January 1945. SS-Brigadeführer Mohnke was forced to relinquish command a short while later as he was again injured in a air raid; this time suffering ear damage. After recovery Mohnke was appointed the commandant of the Reichs Chancellery defense, where he formed Kampfgruppe Mohnke. His Kampfgruppe consisted of 9 Battailons, including the remnants of 33. Waffen Grenadier Division der SS "Charlemagne". Despit a valiant resistance, SS-Brigadeführer Mohnke was captured by the Russians while leading a group of surviors in a break out attempt from the bunker. He was imprisoned in solitary confinement until 1949, he was then transfered to the Generals prison in Woikowo remaining in captivity until 10 October, 1955. He worked as a dealer in small trucks and trailers following his release. Death 16th of August 2001 in Barsbuttel Germany.